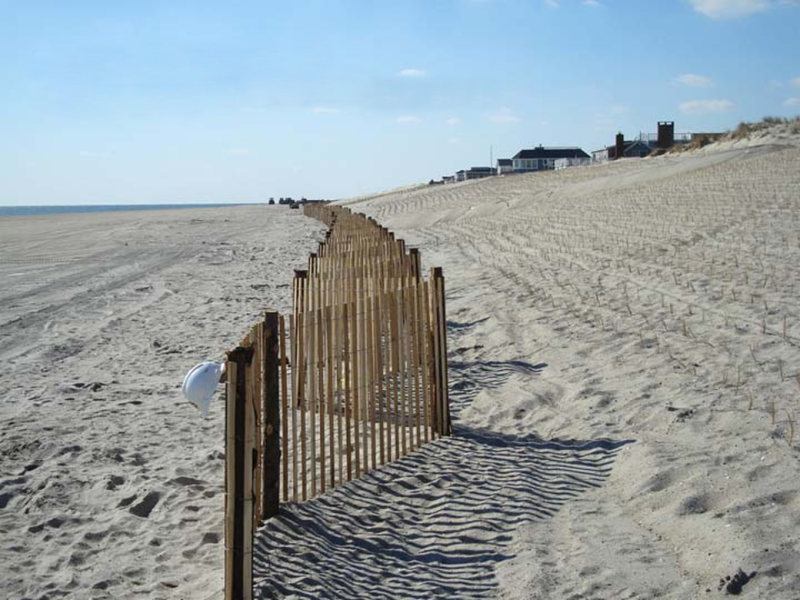 Wooden sand fencing will consist of wooden slats that are woven together with five 2-wire strands of galvanized wire. Our wooden sand fence slats are 48" tall, 3/8” thick, 1 1/2" wide and made of No 1 aspen, spruce, poplar or Southern Yellow Pine. Our permissable variation will not exceed more than 1/16" width and 1/4" length. The thickness of our wooden sand fence slats will not exceed 9/16" and be a minumum of 3/8". Slats will be painted with a good quality red iron oxide stain with both ends cut square. The wire's base metal will be a good commercial quality steel. The wire used will not be anything less than 13 gauge steel wire. Weight of the coating of the wire will not be less than .3 ounces per square foot which is determined to be in accordance with the AASHTO designation T65 (Class I). The zinc coating will adhere to the wire, without flaking and without being able to be removed by the rubbing of bare fingers, when the wire is bent completely around a pin of the same diameter as that of the wire. The wooden sand fence slats will be spaced 2 1/4" apart, give or take 1/4" variance. There will not be any less than 2 - 360 degree twists of the wire in the weave between the slats. The fabric must be tightly woven so the wire is forced into the wood slats effectively to hold them tightly. The wire strands will be spaced 10" apart and 4" from the ends of the slat. The wooden sand fence will be stretched after weaving and before being placed in rolls. Specifications are subject to change without notification and must be verified on an estimate or invoice.